From deep v-necks to slim fitted v-necks, our selection of handpicked custom shirts is perfect for any purpose. Offering men's and ladies shirts, you are sure to find what you need! Not sure what v-neck is best for you? Get in touch and our friendly advisors will help you choose the perfect one for you! If you are looking for a more fashionable type of custom t-shirts, we would recommend our array of v-neck t-shirts ready for printing. Our range of v-neck shirts has everything from the basic v-neck to the more daring and stylish deep v-neck style. These types of t-shirts are usually used for more personalised marketing campaigns but they are suitable to be made into embroidered v-neck t-shirts or have your own design screen printed on to make it an awesome printed t-shirt. The custom shirts are available in men’s shirts and ladies t-shirts so they are ideal for everyone. Depending on the purpose of your personalised v-neck t-shirts, we would recommend a printing technique that would be suitable for your needs. If you are looking to get bulk t-shirts for giveaways or gifts, then we would recommend to get screen printed shirts. If you want a lower quantity but are looking to have them printed to outdoor activities or sports, we would advise to get transfer printing or vinyl t-shirt printing. 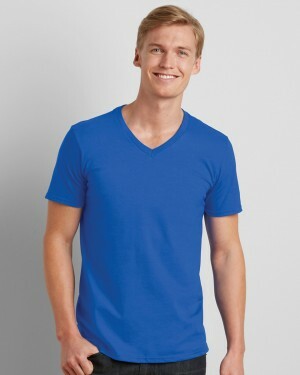 V-necks can also be the perfect garments to represent your business. You can have your logo embroidered onto the shirts or have your business motto and a design printed onto the shirts to give your company some cool and fashionable custom shirts. The personalised v-neck t-shirts are ideal for any occasion and purpose so make sure that next time you need to get some bulk t-shirt printing or lower quantity and want to have a slim fit or fashionable t-shirt, then v-necks are the way to go. Get in touch and we can help advise you which custom shirts are the best for your need!